Home | Newsletter 130: Take a Stand With Farmworkers in Washington! 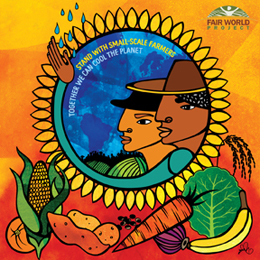 Newsletter 130: Take a Stand With Farmworkers in Washington! Tell Driscoll’s to Be Fair! 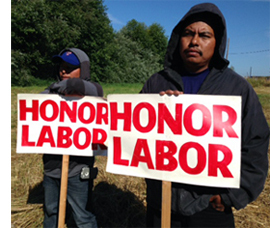 Farmworkers at the Sakuma Brothers berry farm in Washington state have been in a years-long struggle for fair pay and rights protection with farm owners. Workers, under the banner of Familias Unidas por la Justicia (United Families for Justice) have been trying to obtain a legally binding contract that ensures a fair wage and decent working conditions. Driscoll’s is one of Sakuma’s main buyers. Driscoll’s is aware of the situation on Sakuma brother’s farms, but, despite a stated commitment to community and sustainability, workers report that Driscoll has actually increased purchases from Sakuma Brothers since the dispute began. We are collecting signatures between now and March 9th when we will send a letter to Driscoll’s asking them to suspend their relationship with Sakuma Brothers until they negotiate a fair contract with farmworkers. Last week we launched a new crowd funding campaign to help get the message out that by standing with small-scale farmers we can cool the planet and feed the world. The campaign centers around original artwork by Favianna Rodriguez. We’re already 27% of the way to our goal, but there is still time for you to help. A bag of organic hemp seeds from Farmer Direct Co-op in Canada, loose leaf yerba mate from Guayaki, body wash made with Shea Butter by Alaffia, lavender soap from Dr. Bronner’s Magic Soaps, a t-shirt with Favianna’s design and much more are yours for your support at the $125 level. Check out the full fair trade sampler box and perks that come with other levels of support now! The Trans Pacific Partnership (TPP) is a massive trade agreement involving 40% of the global economy. It would drive the race to the bottom. Yet it is being negotiated largely in secret and legislation called Fast Track would allow it to be finalized in secret. 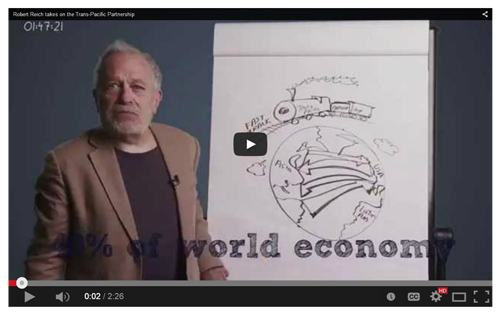 This very short video explains what is wrong with the TPP and Fast Track. Then join thousands of others who have signed a petition opposing this and contact your Senators and Representatives directly to let them know. more. International Fair Trade Week May 23 – 31 in Milan announced. Thailand backs off plans to use prisoners as labor on fishing vessels after international protest. Palm oil demand leads to land grabbing and human rights abuse in Africa.